I was raised in a rural town in the Cotswolds, playing in fields, running about and climbing trees. This eventually turned into hiking, mountain bike racing and getting stuck in to anything and everything, especially outdoor sports. My father is an engineering director in industry (retired) and my mother is an artist, lecturer and the Mayor of my home town. My Sister and young brother both attended the same comprehensive secondary school as me in nearby Cirencester where I successfully passed my GCSEs and then I went on to study A’Levels in Maths, Physics, Psychology and Art in the neighbouring Cirencester College. I decided that I wanted to join the armed service at the age of seventeen in my final year at college after attending a series of career meetings and getting stuck into the college career library. I remember taking a computerised ‘personality profile test’ which helped me draw these conclusions and it was from there that I started researching the Royal Navy and the numerous ways in which I could join. Finding the most suitable option for me was the hardest part. I decided to apply to join as a Marine Engineer Officer in the University Cadetship scheme. The Royal Navy is changing very rapidly in this modern age and quite rightly given the current political environment and hence, required level of adaptation from all three services. This is a modern, professional and historic service that prides itself in being the very best in these categories in the world with developments in everything from wartime hardware to the way the service look after you family and interests closest to you. My experiences in the service have made me a different person to my young eighteen year old self. I am more aware of the world around me. More focussed, determined, confident and better educated than I would otherwise have been and all of this is down to the unique experience that you gain from training with the best peers, supervisors and equipment. I always have stories about my (good and bad) experiences in training to share with my team mates and friends and each one of the events was rewarding and character building. As an eighteen year old officer cadet, I had the chance to lead a division of peers for a week who were all graduates from university and of mixed ages and experience in the services. Although it doesn’t seem like much now, that was a big deal to me at the time and I learned a lot of important lessons in that early week at BRNC. I took the con of a 4500 tonne warship during a replenishment at sea manoeuvre in the Gulf. I went swimming with wildlife in the Caribbean and since then I have been a guest at the First Sea Lords home in London for a private Christmas gathering. These are similar to the thousands of experiences you may get the chance have as a sailor in the Royal Navy. It is hard work, but everyday is worth the challenge. In August 2008 the eyes of the world will be on Beijing as the 29th Olympic Games get underway. For one Royal Navy officer, being there will be the realisation of a lifetime ambition. 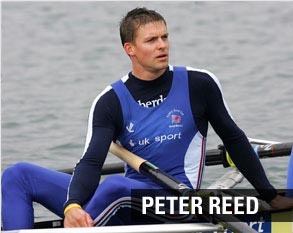 Known as the "Commander" amongst the British rowing elite, the Royal Navy's Lieutenant Peter Reed has won two world championships with Britain's lead coxless four-boat. He has also recorded the largest lung capacity in the world. His next goal is to win gold for Britain in the Beijing 2008 Olympics. "I was pretty good at it," he said. "I remember beating the rest of my division by a country mile and when I went onto my first ship, HMS Cumberland, I had another good rowing machine test." The Navy sponsored him to undertake an Engineering Degree at Oxford University, where his rowing career began in earnest. Within one season he won the Cambridge / Oxford boat race (rowing for Oxford) and won the national trials. He then became British champion and also replaced four time Olympic Gold medallist Matthew Pinsent in the British Coxless Four boat. Furthermore he went onto win three gold medals at the world cup competitions and gold in the world championship, which he repeated the following year. "Barring illness or injury then I'll be in the Olympic team. I've been in very good shape for the last three years and I'm one of the top guys, so fingers crossed," he said. "Going to the Olympics is a really big deal. To represent your country at the Olympics is an outstanding achievement and something very special. I remember watching Linford Christie in Barcelona in 1992 and thinking that's something really cool. "Winning Olympic gold and having your flag raised and national anthem played for something you've done is just incredible. I can't wait to go. It's going to be my first Olympics and hopefully the first of many and I can't wait to get on the start line." "Training is really tough," he says. "There are so many sports that have tough training but I think rowing, along with cycling and maybe swimming have some of the most punishing training programmes." "We eat 6,000 calories and try to get at least ten hours sleep a night, sometimes a little half hour sleep during the day. It's really eat, sleep and train." "Physically it helps to be very, very tall and have long limbs so you've got long levers in the boat," Lt Reed explains. "It's good to be big and strong and have good physiology so have big calves and big lungs. Mentally you've got to be very competitive and very determined, and then don't forget it's a team sport, so you need to be able to work together and be good with people even through some tough times." "It's basically about being around a bunch of really nice and really motivated guys and knowing that they want my seat. That's where I get my motivation from, beating the guys around me. If I want Olympic gold, I'm going to have to work hard to get it." "Camaraderie is great. Off the water it's very different. We spend so much time together every day that if we didn't get on it would be a very miserable job. We're all like-minded and get on very well. By and large everyone wants the boat to be as fast as possible, so it's an honest, competitive environment." "The Navy have really helped in the mental and physical side and really got me going. Since I've been rowing they've really pushed me and helped me all along the way, at every step." "I think my heart just went with the water and the Navy." "My Navy colleagues are on the front line doing actual work and fighting in wars and doing the things that I signed up to. I've just got so much respect for that and I recognise that I'm very lucky. I consider myself lucky every day when I turn up to training, I'm doing something that I really love so, sorry to the guys in the front line but I am working hard to do what I'm supposed to be doing." The coxless four crew that Lt Reed has been so successful with over the last three years is unlikely to change for Bejing 2008. Lt Reed says that, like in a warship, everyone has their role and if one part breaks down the whole machine breaks down. "They're really good guys, really strong and really determined and very professional. I think that's what sets them apart from the rest of the pack. Steve Williams is the current Olympic gold medallist in the team and he's got an awful lot to offer from his experiences in Athens in 2004, rowing with Matthew Pinsent. I'm very much the new guy in the team, the young strong upstart." "We were off the medal podium, going home with nothing but your thoughts to keep you company," Lt Reed explains. "It was very tough. I think we just underperformed, technically it wasn't our best row, but we're in great shape so we know what to work on this season and put right. "It could even be a blessing in disguise. Some people say you can be complacent going into the Olympic season if you're winning everything and you think winning is a formality. Maybe, fortunately, we don't see it like that now. It's not going to be easy, there are people out there who want to turn us over. We were the favourites up until recently, it shows how much there is to do, but we're the guys to do it." "I think he called me the Commander just to get me to do some jobs that he didn't want to do. He calls himself the General and dishes out the silly jobs to the lowly Commander. It's flattering really and good fun." "Redgrave and Pinsent are legendary, not just in rowing but in international sport all over the world," says Lt Reed of the British rowers who amassed nine Olympic gold medals between them. "I don't imagine I could achieve what they've done but I'm going to need to be at least as good as those guys to win gold just at one Olympics." "The Navy is ever so important to me and I've really enjoyed getting my teeth into some proper work, so I'll definitely go back, but when is the big question mark." The first time you slip up and make a big mistake when you are in training and you think that everyone is focussing on you. You feel under pressure from your instructor and peers and it feels like it is the most important thing in the world. The chances are that you are putting so much pressure on yourself that it feels ten times as bad as it really is and you go on to learn from it and realise that it is not that bad after all. I remember that feeling on an assessed command exercise very well indeed. After that I didn’t even feel tired on a ‘middle’ of the night watch ever again! A big highlight for me was being involved in the fleet wide rowing machine competition for HMS EXETER. It was my first week in the Gulf and the ships company had to submit the fifty fastest times for 1000m. It was the first time I had ever used one of these machines (that I have learned to hate) and I remember posting a time of 3:05, the top score. I remember the Commanding Officer, Commander Bennett congratulation me later on that day and feeling very proud of myself. Do as much research into the services as you can. Look on the website, go to your local career centre, use your college or university facilities and take time to think about whether or not you really want to be involved. Then, assuming you still want to have the very best career available to you, sign up. Try to be yourself though the selection process and beyond as you cannot keep a show up for very long before people start seeing through you. You will be living with these people. Try to embrace everything that you get involved in. Don’t be afraid to try new things and remember to learn from other people and their mistakes/experiences. When you are under training, seniors don’t expect you to know anything so try to absorb as much as you can and do not be afraid to ask questions. Before you join up make sure you work HARD on getting as fit as you can. It will make your training life so much easier and you will be way ahead on so many other things because of it. Enjoy your sport!